You are here: Home / Road Traffic Accidents / How do you know if your vehicle is repairable or a write-off after an accident? If your vehicle is damaged in an accident, how your loss is measured will depend on whether it is regarded as economically repairable or not. In this process, it is the market value of the vehicle at the time of the accident which matters as the economic benchmark. The amount it’s insured for does not matter. Neither does the likely replacement cost. The seriousness of accident damage is ranked by insurance assessors using various categories. Prior to 01 October 2017, the four categories were A to D, with A being most seriously damaged and D least severe. In the name of “progress”, this logical system has now been replaced by something less intuitive. The categories are now A, B, S and N. Categories A and B are unchanged from before. Category A vehicles are so badly damaged that they must be scrapped and crushed. No salvage of parts for re-use is allowed. Under Category B, vehicles are again extensively damaged, though some parts may be salvageable. The vehicle must be scrapped and cannot go back on the road. However, some reclaimed parts may be used as replacement parts for other vehicles. Category S replaces Category C. Vehicles fitting this description will have suffered structural damage, for example, to the chassis. The vehicle will need to be professionally repaired. It won’t be driveable until then and it may need to be MOT’d first. For Category N (previously Category D) damage, it’s not structural. These vehicles are in the “least damaged” category. It could just be a cosmetic issue but non-structural faults can include problems with the electrics, the brakes or the steering. Clearly, that can mean significant safety implications and you cannot assume such vehicles are driveable. You might prefer that your car is repaired. However, as you can see from the above, there are times when you cannot insist that your car is repaired. In circumstances where repair is a possibility, bear in mind that all any insurer has to pay you as a maximum is the reasonable value of the car at the time of the accident. In practice, where your car is written off, the insurers will either keep the car and dispose of it for its salvage value – or they will offer you the vehicle’s reasonable value less a small sum for salvage. Accepting the insurers’ cheque in total and letting them keep the salvage. 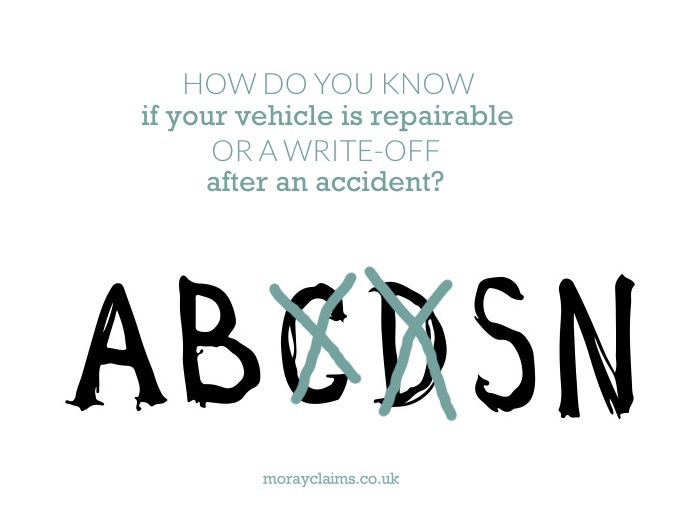 So – how do you know if your vehicle is repairable or a write-off after an accident? As we hope you can see, at the extremes of catastrophic damage and a minor dent, it is easy to predict whether your vehicle will be repairable or a total loss following an accident. In between, there is a grey area where you may be able to insist that your vehicle is repaired, if that is what you want, but the economics may not be on your side. In all of the four categories discussed, vehicles can be written off. Under A and B, they must be written off; under S and N, repair is still an alternative option. Other questions which arise here are how will your car be valued and what if you don’t agree with the valuation? Feel free to contact us, if you have any questions stemming from this article or about any aspect of our personal injury claims services. You can contact us on 01343 544077 or you can send us a Free Online Enquiry. All initial enquiries are at no charge and without obligation.